OHS veterinarian preforming surgery in the clinic. I took Gracie (the best cat in the world) to the veterinarian today. I sent her OHS medical file over to her vet in preparation. I was struck by how long it was— four pages of treatments, medications, dental surgeries, etc. She was a very stressed and ultimately sick cat, who, owing to her 10 years also needed a lot of dental work to be ready for adoption. It occurred to me that she owes her life to a lot of people and to the fact that the OHS has its own in-house veterinary clinic. The OHS first acquired its own clinic space when Bayview Animal Hospital moved out of the Champagne Avenue shelter in 2005. The goals of the new clinic today seem modest, but important. 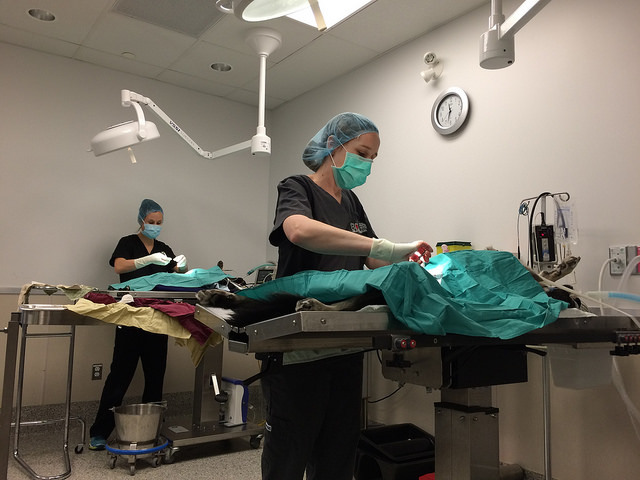 Our primary concern was eliminating spay/neuter vouchers, the progressive, but not 100 per cent reliable way to ensure that animals adopted from the OHS would not reproduce and contribute to pet overpopulation. The clinic and our own veterinarian would allow us to sterilize all animals prior to adoption. The needs, and our goals soon expanded dramatically. With our own clinic, a host of other needs could be filled. Dental work became possible. It is simply not realistic to adopt an animal to most people and expect that the next day, they will shell out hundreds, or even thousands of dollars for needed dental work. They won't adopt or they won't have the dental work done — and the risk of a lifetime of pain for that pet is too great for us. But, if we can do the dental work before adoption, then sweet older animals like Gracie can look forward to a comfortable retirement in a forever home. Moreover, animals with serious, but treatable, injuries and needs could be treated in-house, reducing costs and allowing us to bring more animals back to health. With the move to West Hunt Club, and the larger and more modern clinic here, the number and range of surgeries and treatments increased significantly. The larger facility allowed us to invite more community veterinarians to supplement the work of our staff veterinarians and I am delighted that many of our local veterinarians have answered the call. Even with volunteer vets and our frugal approach to our work, all kinds of medicine are expensive — very expensive, in fact. While we hear that everyday inflation runs under two per cent in recent memory, inflation in the medical realm often runs at 10 or more per cent. Veterinary medicine is not immune. Between inflation and our drive to help more animals, costs have increased a lot. I want to make sure animals get a second chance and a forever home. That includes animals like Gracie who needed more, even a lot more care. And I know you want it too.